Laces by veteran filmmaker Yankul Goldwasser is certainly one of the best Israeli feature films that I have seen this year! It offers a striking emotional and complex story about the relationship between a father and his grown son with special needs. I think I especially liked it because of three things — the complex narrative, the wonderful and in-depth portrayal of the characters and the fact that it offers a window into the world of people with special needs — their capabilities, their humanity, and capacity for love — a world that is unknown to so many of us. 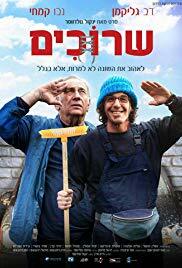 Gadi’s parents were divorced years ago and when his mother dies in a car accident, even though he is a grown man who has lived his entire life with his mother, he is forced to go to live with his father. Slowly we get to know both Gadi and his father and watch as their relationship develops. The father owns a small auto repair shop in Jerusalem and he brings Gadi with him to work every day to help out. Eventually Gadi becomes attached to his father and his circle of friends. The story has many sub-plots, including both father and son searching for love. As the father begins to go out with Gadi’s social worker, Gadi becomes infatuated with a waitress at the nearby restaurant. But the real love story is the one sprouting between father and son. There is another level to the story — the father needs a kidney transplant and part of the story deals with the ethics of asking a man with special needs, who might not fully understand all the ramifications, to donate a kidney in order to save his own father. I found the film to be compelling on an emotional level and it haunted me for days as I was thinking about the characters and what happened to them. There is also some charm and humor — for example, the title refers to one of the ways that the employee from the department of social services tests Gadi’s disability — does he know how to tie his own shoelaces? The character of Gadi is played by Nevo Kimchi in a striking performance which shows his impressive talent for internalizing and portraying a character so unlike himself. Laces is available from Go2Films.